Today’s the big day!! Start sending that positive energy my way!! Please!! 🙂 ill let you know how it goes.. Eeek! 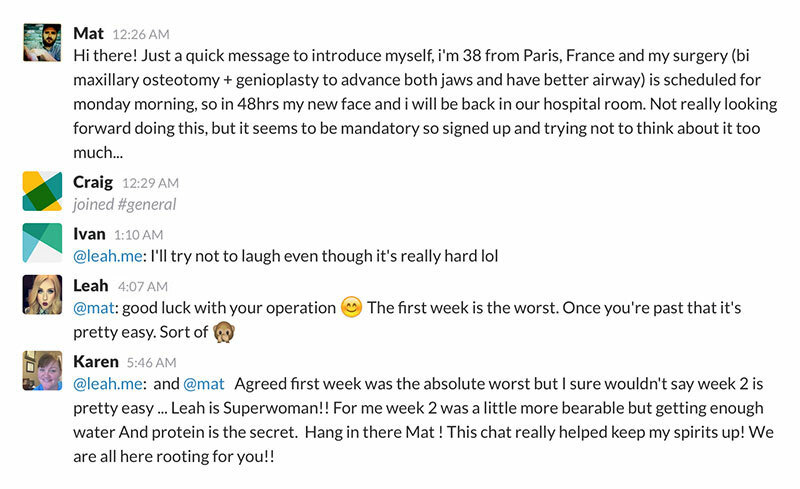 I left you a comment a few months ago regarding how helpful your blog had been in preparing me for the jaw surgery I just had on January 24th of this year. I’m 8 days post op now, and my story is going so much different than yours so far! I suppose everyone’s experience is different. I had my upper jaw raised (to eliminate a very minor issue with gummy smile), my septum adjusted to make room for the upper jaw, my lower jaw moved forward and rotated up to close an open bite and compensate for recessed chin, and a piece of my lower jaw cut and moved forward 5mm to create more of a chin. My surgeon said things went SO perfectly that I don’t need a splint or rubber bands. I stocked up on loads of ensure only to find out the stuff kind of makes me gag (too milky for me) so I had to get a bunch of ensure juice instead. Anyway, I’ve gotten so many great tips from your blog! My only main concern right now is the swelling and I wanted to ask you if icing the area really does help the swelling go down or if it just helps temporarily reduce it a little…? Tami, I’m so jealous of your rockstar recovery! As for the swelling, it’s really just a battle with time. Applying heat or ice will temporarily reduce the swelling, but at the end of the day, it will simply take time for it to go away. I am having my double jaw surgery in two weeks (February 5th) eeek! I am VERY excited but EXTREMELY nervous and anxious. First of all, I have never been in the hospital especially overnight, so the thought of having all those machine and IVs hooked up to me is quite daunting. Secondly, and this is where you are going to think i am nuts, I am getting married 4.5 months later. Here is my question..do you think I’m going to be okay?? do you think i am crazy?? My doctors (the ortho and the oral surgeon) both assure me I will be perfectly fine, however, i see it took you 6 months before you got your braces off. I plan on getting veneers to cover a few of my front teeth before the wedding because I had braces when I was little and the ortho failed to put an enamel protector on my teeth so when he took them off, a few of my teeth were quite damaged :/. My doctor said I could probably have my braces off by the end of May leaving me just enough time to get the veneers; but the timeline is just soo tight it makes me super nervous. First off, worry not about the hospital. While they can be uncomfortable places, know that it will be very short term and you’ll be at home in your own bed by the second or third day. Try to sleep your days away while in the hospital. You can also go exploring with your new friend, Ivy (your I.V. stand, of course). As for your wedding, you should be in good form by the 4.5-month mark, but you’ll still have your braces and you may not be eating every food under the sun. Your swelling should be gone and your energy should be back by the point, though, so braces will be the only thing you’ll have to think about. If I were you, I would go ahead with the surgery. It’s best to put it behind you so you never have to think about it again once you get married and begin that chapter of your life. I would like to ask about your recovery, basically its been almost a month since my surgery and I noticed that the alignment of my upper teeth (the middle line of my two front teeth) is not aligned to the middle of my face? or middle of the nose. Long story short, it seems like the upper jaw is off center and I wanted to ask if you had a similar experience..
90 days for me today! Woo-hoo! What a long, slow, fast, quick three months it has been. Still have a follow-up surgery to correct my deviated septum, a slight “off” feeling in my chin, somewhat puffy cheeks, and a mouth that doesn’t open all of the way — but otherwise I feel just about back to normal. Jamie, your “long, slow, fast, quick” statement is about the most accurate description of the recovery I’ve heard yet! The movement of your jaw and your puffy cheeks will be back to normal in a few weeks. Remember to chew gum! Again…if I move to Canada for a year…will they cover me? I hope the second opinion on Friday serves you well. Since I don’t know what you looked like before (or now, for that matter), I suppose my words aren’t entirely encouraging. In any case, I wish you all the best in figuring this out. As for being covered in Canada after 1 year, you’ll have to research how the health coverage here works. I’m not sure if you need to be a Canadian citizen to be covered or how it works. Insurance and health coverage boggle me. I don’t think the humpty dumpry look is okay. My friends and family all think I’m still swollen. According to the doc, I’m not. So I know its not me. I have two of my besties that think I looked great before. They tell me I looked way better. My sister told me my chin looks like Michael Jackson’s chin. I have another friend that tells me look like big ang from the new jersey housewives. I mean I’m a complete hotmess. I think I look like Geston from beauty and the beast. Argh! im at my 4 month mark and my face just looks ugly now. Or looks fattwr and longer. When the swelling was first going down i thought it was okay. Like during mid 3months. But now I just look like the egg from Puss and boots. My profile looks like the moon. Wtf. I think I might need a second surgery. I’m moving to canada. U tjink theyll cover me? Stephanie, have you spoke with you close friends and family and asked them if they think your appearance has suffered as a result of the surgery? We’re often our own worst critic, and perhaps you just need to get used to the new shape of your face. I remember disliking my appearance at first as well, but I eventually realized that it was just the fact that it was different than what I was used to. Stephanie, you have nothing to worry about. Scar tissue will not form on the exterior of your face. The worst that will happen is parts of your face will tight until the scar tissue is broken up. You can help break it apart by whistling often. The heat packs are really just for your personal comfort. If you can sleep through the night, they are no longer necessary. I wouldn’t worry about your loose tooth at this point, either. If it persists once your 90 days have concluded, have your orthodontist take a look at it. It’s not uncommon for certain teeth to feel loose while your braces are moving them around. Marisa, I’m glad you could find a bit of comfort in my experiences here on the blog. I wish all the best for Derek in his recovery! I’m back!!! Lol…okay no longer scared about the swelling, maybe a little because I’m going on 60days. But that’s not why I’m here. I’m geotek because I want to know more about the scar tissue. I could Google it but um too scatter brain to stay.on the one subject….I’m A.D.H.D. you said whistling would get rid of it. What else will? Can it form outside of ur face? What if I have keloid skin? What if i haven’t been exercising my mouth for the two months that I’m in, is it Rio late now? Onw mire question about swelling….I stop using Ice and heating pads my 3rd week….is that gonna be a problem with my swelling? Today my 17 year old son had jaw surgery to widen his maxilla. He was born with a cleft palate and had a similar surgery 11 years ago. We have blissfully forgotten most of the “bad stuff” from that time. I read through your entire blog today while waiting for Derek to get out of surgery, into a room, etc. Thank you for sharing your experience with the world! You have really had great results. Derek isn’t interested in the blog yet but maybe in a few days he will be. Having my chin and nose reconstructed was just all part of the same operation. When the surgeon reshapes your jaw, other parts of your face cave in or protrude as a result, so they often have to rebuild these. It’s all for the better. My surgeon’s name is Dr. Lahl and he works out of his Edmonton clinic, Renew Surgery. I highly recommend him, even if just for a consultation. He’s excellent at explaining what your best options are. WOW! 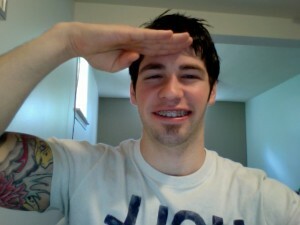 You whent from looking like Ovechkin (sp?) to more like Crosbey lol. Congradulations you look great. I also have an underbite caused by both small maxila and a large mandible. I have been plagued by thoughts of having surgery done for years. It is the upper jaw surgery that scares me rather than the lower jaw surgery. It seems like the roots of my upper teeth are quite close to my nasal passages so there is not much bone there to cut and they would probably have to cut through the nasal passage. I would also like to have my upper jaw moved down as well as forward if possible. I realize this is something I should probably discus with a surgeon but i noticed that you said your surgeon had to reconstruct part of your nasal passages. Did this have good results? Did they move your upper jaw down at all? Also I live in Calgary and have been trying to find reviews of local surgeons here but havent had much luck. I might be willing to travel to Edmonton for the right surgeon. What was his name again? And would you recomend him? Do you know anyone in Calgary who could recomend one here? Sorry about all the questions. Any thoughts you have would be appreciated and thank you for shareing your experience with the rest of us. I’m near 2 years post-op at this point and parts of my chin are still tingly as well. Permanent numbness is something a few of us will have to deal with. If you’re at the 70-day mark, I wouldn’t accept this being permanent just yet. The “nerve jolts” you’re experiencing are common during the first 3 months of recovery. Your nerves are still repairing the bruising they incurred during the operation, and jolting pains are part of that process. I’m at about 70 days past my Bimax and still have a tingly chin. When I shave I can feel tingles and jolts even extending to my gums. Feeling seems to be coming back from the corners of my lower lip and moving inwards, which is good, but a few times a day I feel a very strong, random, nerve jolt almost like a shock or prick. They are strong enough to interrupt conversation or eating for a second. Did you get a few of those too? Thanks! I’m super glad you’re not experiencing any pain. That’s such a relief, isn’t it? It sounds like you’re some sort of recovery superhero. I can’t believe how quickly you’re jumping back into action here. I am day 7 post op! Your blog is very motivational. My swelling was considerably worse than normal so I had to remain in the ICU for 3 days and left the hospital on day 6. I experienced virtually no pain, just slight aches. I found out that I’m allergic to every pain killer they had me on so I had to survive on some regular paracetamols to keep me going. I regained my energy around day 5 surprisingly. My swelling has gone down a bit. My lips are back to normal, I have feeling all over except lower right chin but only tingly! My face definitely feels stuffy. I don’t like that my nose is always clogged up. All in all, my doc removed my splint within a week. I’m on elastic bands and I’m allowed to have mashed potatoes and eggs. Great huh? My surgery involved moving my lower jaw back and upper jaw forward. We grafted some bones off my nose somewhere to help me with breathing difficulties I’ve had for years. I’m able to smile, talk a bit. Everything believes I’m healing remarkably, mainly because I’ve been very optimistic about this surgery. I’ll give it 3 months for my bones to completely heal. But boy do I miss food!